Halloween season is upon us, but as with any other season, no purchase should ever be full-price for true Couponers! Head on over to Halloween Express for deals on costumes, accessories and decorations and use our promo code for 15% off any order or a sweet BOGO 25% off deal. The variety of masks, hats, and wigs just might get your head spinning so we narrowed down our haunted hunt to top five movie-inspired favorites from the New for 2012 collection. 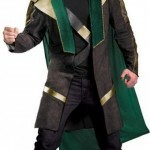 First up is a number for guys who are up to play the bad guy with an Avengers Loki costume. The getup is straight out of this year’s box office hit The Avengers, so you’re sure to ward off any costume-recycling suspicions as soon as that cloak is on. The costume consists of a jacket with a detachable cape and a headpiece. Pair it with plain (but tough) black denim and tank and you’re set. Thor would be intimidated at the least, and so are we! Next is for the women mesmerized by Anne Hathaway’s Catwoman killer everything in The Dark Knight Rises. Admit it, you all were! (Speaking of The Dark Knight Rises, did you know that Ryan Gosling and Leonardo DiCaprio were considered for the role of Robin? Joseph Gordon-Levitt was ultimately cast but something tells us there was no way to mess up that decision.) The costume includes a sleek, black spandex jumpsuit, boot tops, a mask and belt to hug your curves and command attention in all the right ways. There are no stiletto heels that double as serrated knives, but, for humanity’s sake, we can leave that to the superheroes and settle for a simple pair of heels from the closet. The next pick for women is inspired by a film from the archives, although the costume is brand new. Bring back a Tim Burton classic with this sassy Beetlejuice getup, which includes an unmistakable striped mini-dress with a necktie and signature wig. We don’t guarantee that you’ll automatically take on Beetlejuice’s crude demeanor, but it sure can’t hurt to try! This kids’ Merida costume from the animated film Brave captured our hearts with its adorable puffed sleeves and golden trim. 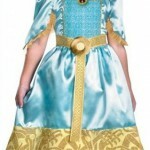 Transform your little one into a Disney princess with this dress, attached character cameo and belt. Make your own bow over a DIY craft (and bonding!) project, or get a fiery red curly haired wig to complete the look. Don’t leave your pet out of the festivities! If you’ll be decked out in all your Halloween glory, treat your furry friend the same. We know that the Underdog TV series premiered in the 60s but isn’t vintage “in” right now? 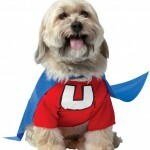 This Underdog costume for your pup comes with a red “U” top and blue cape, ranging from extra small to extra large. After all, superheroes come in all shapes and sizes! There’s even an adult (human) Underdog costume if you’re really in the mood to show the world your dog devotion. So there you have it, Couponers, our big-and-silver-screen inspired favorites for Halloween 2012. Head on over to Halloween Express on our site for more spooky steals. What will you be?